Eggs: First generation eggs hatch in approximately 10 days; those of the second generation turn a reddish colour and hatch the following spring. Immatures: Small caterpillars have a white body and a black head. The body of larger larvae is relatively green and their head turns reddish-brown or yellow head. They feed inside tied or folded leaves and on flowers of some hosts. Pupae: Pupation occurs within rolled leaves, or between the stem and petioles. Adults: Are yellowish-brown to reddish brown in colour, have a wingspan of about 10-17mm. Some individuals may have a triangular (or sub-triangular), dark mark mid-way between the base and tip of each forewing (the wing you see when they are at rest). There is significant colour variation and may appear more grey or lighter in colour, particularly individuals that are relatively old. The dark region varies in size and shape and sometimes isn’t present. Eggs are laid mainly on the lower surface of mature leaves on plants of all ages, but older plants are preferred. However there appears to be significant variation in egg laying behaviour depending on the exact strawberry variety. 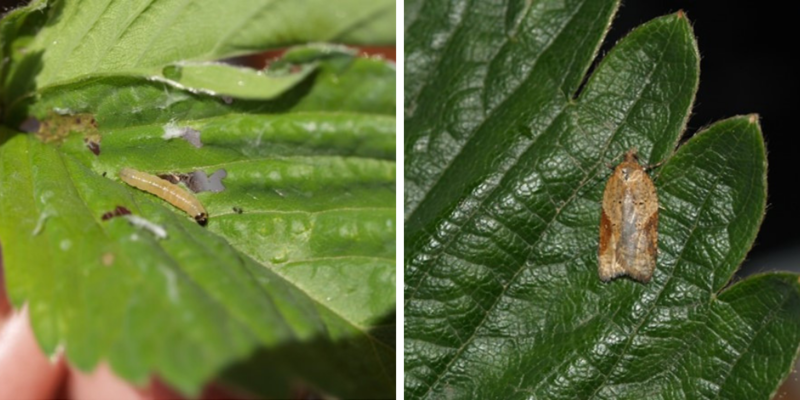 Larvae tie or fold leaves together but may also feed on flowers. Feeding on strawberry flowers distort fruit development resulting in reduced yield. This normally only occurs when populations are relatively high. For more information, visit the Pest ID website.